The Rapid Deployment Portable Spike Barrier is the ultimate answer for rapid roadblock response with minimum manpower. This innovative roadblock is a compact, lightweight, and fully portable device that takes only 20 seconds for out-of-the-box deployment. When needed for high-speed, single person ambush use, the Portable Spike Barrier can be positioned in as little as 5 seconds. 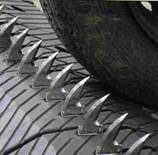 Very steady and stable on any ground, the self-release mechanism on each of the RD-01’s hollow spikes remain embedded in the tires they puncture, deflating them in less than 4 seconds. The unit stops vehicles with equal efficiency no matter what speed or angle they are traveling, and it does so in a manner that is safe to use – with no danger to passengers or damage to the vehicles. Highly cost effective with no maintenance required. Made of the highest quality materials, all elements of the RD-01 are treated for corrosion resistance. Can be deployed from a car trunk across an entire highway in under 2 minutes. Stops all forms of vehicles from trucks to motor bikes. Long operational life units over 10 years old are still in use today. All tires are destroyed immediately; the safest way to stop a hostile vehicle. Standard system covers a 16 foot span (5 meters). Can be operated using land line or remote control. Can be operated from over 260 feet (80 meters) using the secure signal remote unit. Empowering Law Enforcement Officers and Military Worldwide. 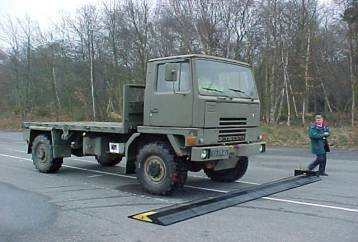 This Product is Used permanently at some border crossings, temporarily to enforce vehicle checkpoints as well as deployed tactically to support some military operations, This Products is the last word in portable vehicle immobilization. Enforcement officers are capable of selectively immobilizing a targeted vehicle in the safest possible way. The visibility of the product alone acts as a great deterrence he performance, durability, reliability and operational life-span of our products prove to make this systems a valuable asset for many law enforcement operations. There are two product to choose from Mobile, Military and Permanent. You can learn more about how an entire highway can be secured within minutes. The radio operating system is a 'Dual Conversational Code Hopping when the authorized signal is transmitted to the receiver, the receiver transmits a signal back to the hand unit which, in turn, returns the signal re-coded This random re-coding has in excess of 16 million combinations. Extremely fast response time From WAY CLEAR to ROAD BLOCKED in less than 1 second. The sharp leading edge of the blade pierces deep into the tires cavity. The top sharpened radius slashes a long gash as the tire rolls over. The sharpened vertical edge of the blade slices outwards as the tire tears away. A minimum of two blades enter each tire as it passes over. 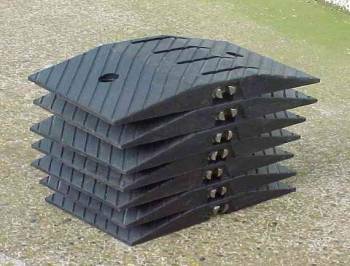 Occasionally, the blades will become damaged through heavy use or incidents where the blades come into contact with, for example, a poorly fitted exhaust system Each blade can be removed and replaced using a simple two screw fastener. The replacement of a blade can be achieved in minutes. 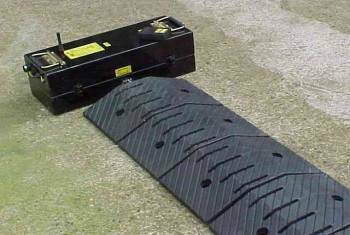 Can be used on uneven surfaces due to built in camber compensation. Manual and remote control option. a 20 meter a width of over 65 feet is possible with the simple addition of panels. if impacted while the vehicle is skidding the panels will move into a natural curve at impact ,however each corner of each pad impacts with its neighboring pad , thus absorbing the shock of the vehicles impact. The radius of the wheels fitted to the panel keep it firmly flush on the ground. The unit is fully functional and fully effective in this state. Blade Pitch: 2 1/2 inches (Blade to Blade). Simple two screw per blade replacement system. Heavy duty battery gives approximately 200 operations per charge. Secure radio signal for remote control at over 80 meters. Extra heavy duty pads ensure even the widest Tires are Punctured. This Products is currently Used at Some border crossings with a traffic flow of over 14 million vehicles each year. Male & Female couplings: Stainless Steel. Outer made from 1st use 80 hardness high grade rubber. Pads can be made in any color using a full depth mix. Blade carriers: Case hardened, flashed and Chromed steel. Blades located to blade carrier using two M4 stainless steel screws in multiple teeth mesh.